Agreement: Required I agree to process my job. If proceeding without a PDF Eproof, after completion of my order any claims regarding my artwork will not be accepted. Used in indoor and outdoor backlight signs applications as Light Box, Windows, Restaurant Menus, Hospitality, Signage, Directional Signs. Free UV Glossy Lamination will help your sign from fading with sun exposure. Single Layer Print - Suggested to be used in Daytime. Please be aware, colors will lighten when used with Light Box at night. Double Layer Print - Suggested to be used at Night with proper Light Box. Please be aware, colors will appear darker in Daytime or without Light Box. Surfaces to which the material will be applied must be thoroughly cleaned from dust, grease or any contamination which could affect the adhesion of the material. 1 business day for most banners. Production starts after your design has been approved if proof is required. Orders approved after 2PM will be shipped the following business day. Quantity is limited to 5 banners. For larger quantities & sizes, please call us to confirm the turnaround time. 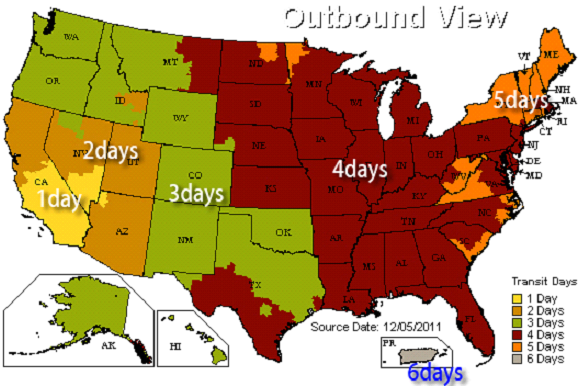 There is no guarantee for ground shipping, it can be delayed 1 or 2 days by UPS. Weather conditions could also cause your package to be delayed. No refunds will be issued for products and shipping regarding any delays. Please plan your order with 1-2 days in advance before your event date for these circumstances. If you choose Ground service, UPS doesn't deliver on Saturday, Sunday, or Holidays. You should pick the Next day + Saturday option if Saturday Delivery is required. SATURDAY DELIVERY is only available for Next Day + Saturday Orders. Please call us and we can help in placing your order. Please complete your order prior to uploading your artwork. Artwork uploaded prior to having an order placed will be disregarded. EPS – Please embed all images. Outline all fonts and strokes. Ai – Please embed all images. Outline all fonts and strokes. Artwork at either full scale, 1/2 scale or 1/10 scale that is fine. Just make sure that when the file is being set up the DPI is compensated according to the scale. ***Remove EVERYTHING from your file that you do not want printed on the final product - especially hidden layers and template guidelines. - If using a template, the file uploaded to our site should match the exact "template size" (different than "graphic size"). - Make sure all objects are embedded and flattened (we do not print Non-Native Art). - If the file is made in Indesign, please flatten the file in Illustrator or Photoshop and export to a JPEG ONLY as we don't recommend using Indesign at our facility. - If using Compound Paths to create transparencies/shapes, please completely rasterize or flatten them into the file or they may print incorrectly. - We do not have specific measurements for Panel jobs. If you are printing in Panels, please make sure you are providing a minimum of 1" overlay in your files. Please make sure that your file is in CMYK format for print production with no bleed. It is not required. Eproof: A digital trial sheet that is made to be checked and corrected if needed, before sending final artwork to be printed. Proofing is an optional $20 service we provide in which we allow you check what your file will look like before being printed. Each customer is limited to 3 eproofs per file being proofed. Additional eproofs will accrue an additional $10 per proof. Once you approve the eproof(s) with OK to Print: you are stating that the eproof(s) are ready to print, and cannot be revised or reprinted without additional costs. Please be mindful that your turnaround (48 hour or 24 hour) does not start until we receive your approval for printing. BannerWorld.com is not responsible for any copy or design errors including: misspellings, date errors or color variation. Cutoff time for approval for eproof(s) is 3:00 PM PST Monday through Friday. Failure to approve an eproof(s) on time will result in pushing production time back 1 business day, or rush fee's will be applied to your order. If expedited shipping is needed because of failure to approve a job on time, additional shipping fee's will be applied to your existing order. 1. Always roll your banner with the design to the inside. Make sure the banner is completely dry before you roll it up. Do not store it when wet or damp. 2. NEVER FOLD THE BANNER! 3. Never use a rubber band to secure the banner roll as this will casue creases. 5. Store in a cool, dry location. 6. Clean with a soft, damp rag if dirty. 7. Do not use harsh substances like chemical cleansers or scrubber sponges on banner. 8. Keep the banner away from solvents such as paint thinner, acetone, alcohol, gasoline, etc. 9. Do not allow the banner to have ink to ink contact with itself or any other type of print or paint. 1. Always roll your banner with the design to the inside. Do not store it wet or damp. 4. Loosely roll onto a rigid core or tube of some kind to ensure that it does not kink, crease or smash. 5. Do not use harsh substances like chemical cleansers or scrubber sponges on banner. 6. Keep the banner away from solvents such as paint thinner, acetone, alcohol, gasoline, etc. 7. Do not allow the banner to have ink to ink contact with itself or any other type of print or paint. 1. If your exhibit fabric has a zipper, please keep zipper closed for storage. 2. Wrinkles can be removed with cool iron or fabric steamer. 3. 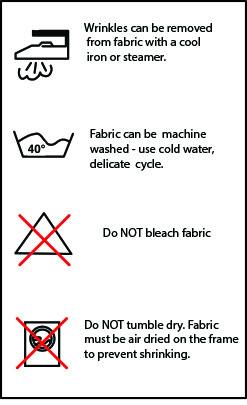 Fabric should NOT be stored when damp or wet. Store in cool, dry area. 4. For storing graphics please remove from plastic packaging that was provided and keep fabric in cool/dry place. 1. Your fabric graphic can be machine washed. Remove any hardware attached to the fabric prior to cleaning. Use MILD soap and cool water. Air dry fabric, dry on frame if frame is available. 2. Fabric must be COMPLETELY dry prior to storing. 1. Treat stain from backside of fabric. 4. If a cleaning solution is used, rinse the area well with water to ensure NO solution is left on fabric. 5. Most stains can be treated with household fabric stain removers. It is ALWAYS important to test how the solution will react to the fabric. This can be tested by dabbing solution to a small corner of the fabric. Most household cleaners will provide treatment instructions depending on the type of stain. Product meets National Fire Product Association (NFPA) standard 701 for Flame Resistance. 1. Wrinkles can be removed with cool iron or fabric steamer. 2. For storing graphics please remove from plastic packaging that was provided and keep fabric in cool/dry place. Fabric should NOT be stored when damp or wet. 3. 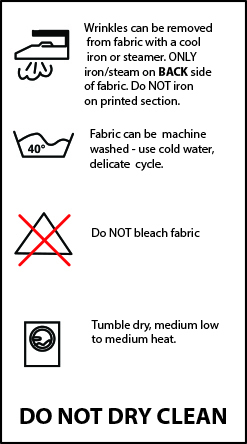 Do NOT iron directly on printed sections of fabric. 1. Your fabric graphic can be machine washed. Use MILD soap and cool water. Tumble dry medium low - medium heat.